Bulging honey is great for a honey super where I want as much honey on each frame as the bees can manage. I deliberately space out the frames so the bees will draw thicker comb on it. But bulging comb of any kind is not what I want to see in the brood nest. The brood frames can’t be spaced evenly against each when bulging honey gets in the way. (Have I just coined a phrase, bulging honey?) When I installed my nucs, the frames of bulging honey created uneven spacing — and extra space between the frames. The bees want to fill in that extra space and they often do so with bridge comb, which breaks apart and makes a mess in the brood nest whenever I need to inspect a frame. 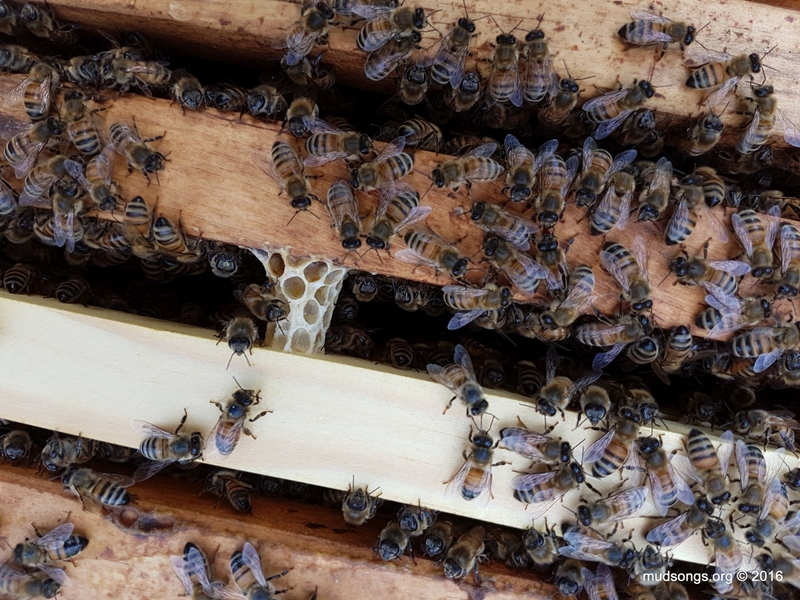 I took a quick look at one of the nuc hives today and already noticed bridge comb. What a pain. In a standard Langstroth hive with foundation, all the foundation usually has worker-sized cells imprinted on it, so the bees tend to build worker brood comb on it, not drone comb. 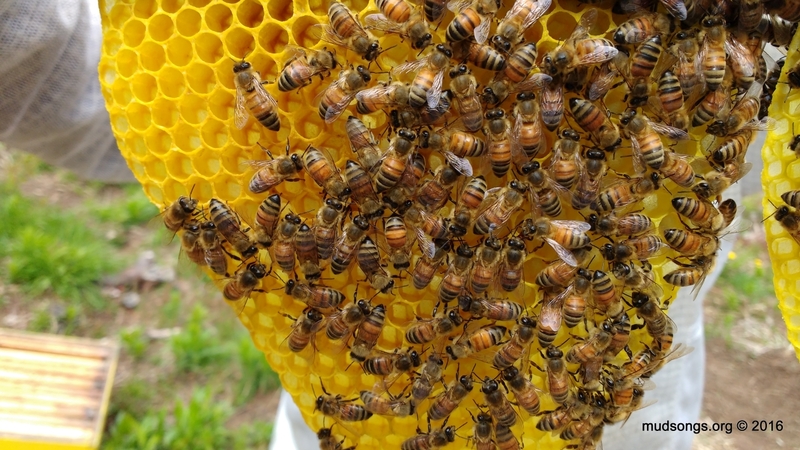 That leaves the queen with nowhere to lay drone comb, so she’s forced to fill the space between the boxes with drone comb — drone comb that is a big ugly mess to clean up in the spring. That’s why I insert at least one foundationless frame into the brood nest of every colony. Given the choice to build comb however they like it, if they’re short on drones (and they usually are in a Langstroth hive full of plastic foundation), the bees will (usually) fill the foundationless frame with drone comb instead of gunking up the space between the brood boxes with it. 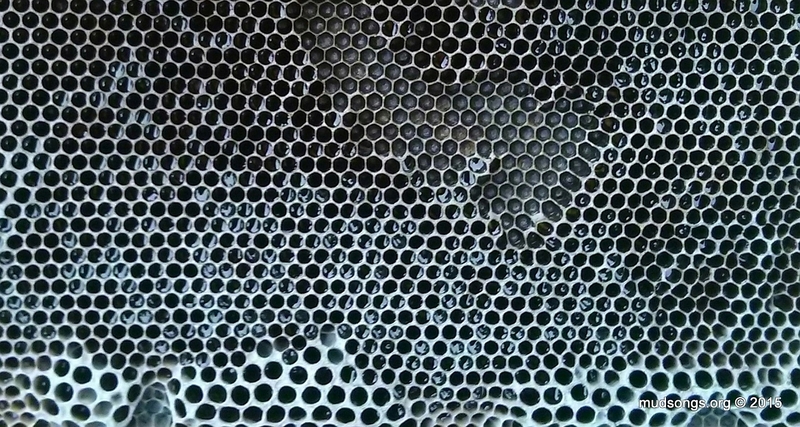 …naturally drawn out drone comb with freshly laid eggs inside most of the cells. The wax is yellow probably because the bees have been collecting dandelion nectar and pollen for the past few weeks. Click the image to see a much sharper close up view of the comb. I fed my bees sugar syrup until it was too cold for them to take any more of it, which isn’t always the smartest thing to do because even though the bees are able to store the syrup, they may not have time to cure it (evaporate most of the water from it) and cap it like they would with honey during warmer weather. Subsequently, as in my case, the ole beekeeper discovers a top third deep filled mostly with uncapped syrup — or as we like to say in the real world, moisture. 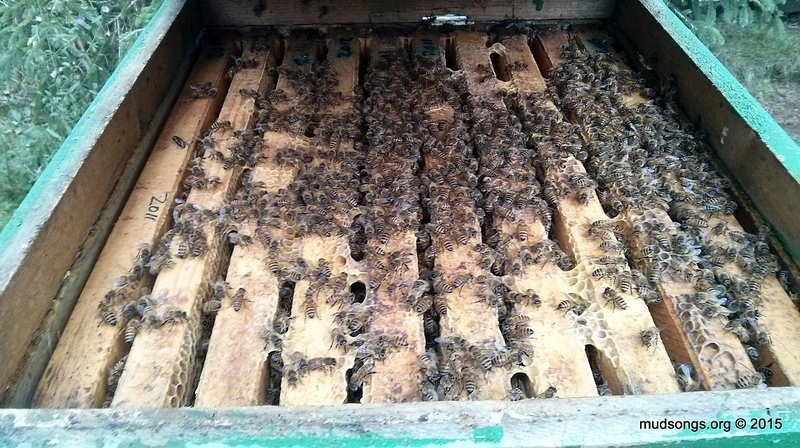 Not enough moisture to drip down on the bees and kill them, but enough to dampen the frames and allow some mold to grow. I wholeheartedly agree with that beekeeper. He seems like a smart guy. Hive inspections every two weeks aren’t always such a bad thing, especially for new beekeepers, because one of the best ways to learn what the bees are up to is to see what the bees are up to. (Collect that data!) I found an excuse to dig into my hives at least once a week during my first summer of beekeeping, and I learned more from my intrusiveness and observing everything up close and personal than I ever did from reading or watching the bees from a safe distance. Yes, there is a risk of disturbing the bees and killing the queen, but I was careful and gentle and made sure to put all the frames back the way I found them, and everything worked out fine. Regular inspections also allowed me to remove comb and propolis that would have otherwise gunked up the frames and made future inspections messier, more difficult and perilous for the queen. Messier — because comb connected between frames will often split open and scrape against honey in adjacent frames and spill honey all over the place. 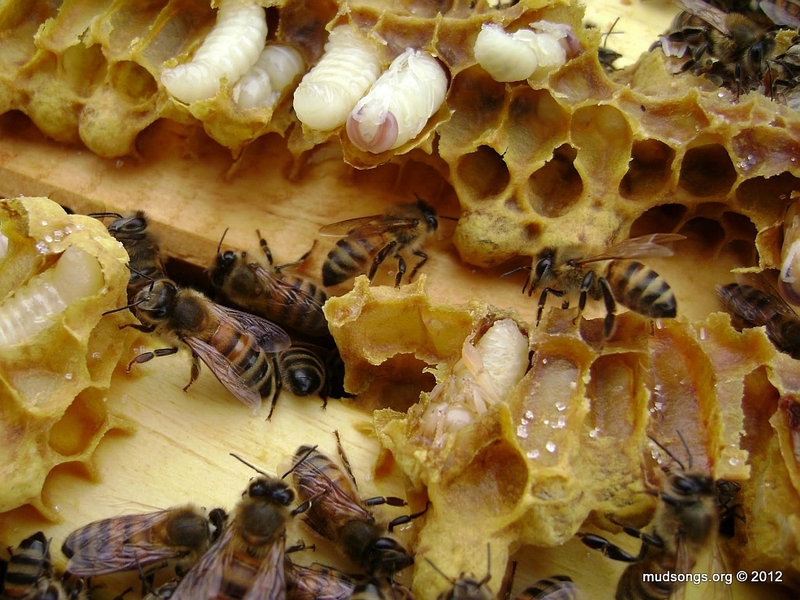 Drone comb, especially between brood boxes, is exceptionally gross when pulled apart. Difficult — because frames that are bonded to the hive box with propolis don’t move. It requires careful maneuvering to pry out the frames with a hive tool — to snap off the propolis — and even then all the extraneous comb between the frames tends to squish bees and tear up honeycomb as well as brood comb along the way. Whereas frames that are cleaned up every two weeks can usually be pulled up with bare hands. Perilous for the queen — because any comb between the frames or the brood boxes can easily trap and kill the queen (along with other bees) while the frames are being pulled out. (Some refer to this as rolling the queen.) Comb between the brood boxes leaves no space for the queen. If the queen is on that comb while a frame is slid back in, she’s dead. I’ll try to update this post in the future with more detailed photos that illustrate what I’m talking about. For now, though, here’s a photo of a hive that I haven’t touched for almost three months. Those frames are super-glued to the hive box with propolis and are held together by brace-comb as one big solid 10-frame block. Pulling those frames will be one seriously tangly experience (an experience I’m glad to have avoided during my first summer of beekeeping). This is Part 2 of some hive inspections I did yesterday. It’s a 3-minute video that, among a few other things, shows what frames of pollen and nectar look like. Again, this may not seem like the most scintillating thing on the planet, but new beekeepers will want to know what this stuff looks like. By the end of your first summer, you’ll want to know the difference between frames of pollen, nectar, honey, worker brood and drone brood. And if you’re in Newfoundland, most likely you’re flying blind and you’re on your own. So if you have 3 minutes to spare, you might want to take a look. Part 1 of the video: Making Room for the Queen. There is no Part 3. I thought there would be, but there isn’t.